www.7sultans.com 7 Sultans Casino is the largest and longest running casino of the Fortune Lounge group, who also run several other casinos including Desert Dollar, Vegas Palms and Platinum Play. 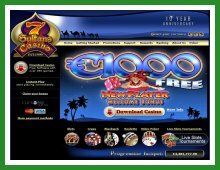 7 Sultans is a far-eastern themed site, featuring “eastern hospitality” and a wealth of over 400 games with best-strategy features, autoplay and progressive jackpots thanks to the Microgaming network. 7 Sultans was established in 1999, and the site is just about starting to show its age. The graphics and styling of the site itself could benefit from an upgrade, as they are looking a little basic compared to other similar sized online casinos on the market. However, it has a great choice of gameplay, so if you are more concerned with game choice than looks, this may not put you off. Games offered include Slots, Roulette, Blackjack, Baccarat, Craps and Keno, plus video poker. They feature progressive and non-progressive jackpots, thanks to the Microgaming network, and impressive prizes which can range from a few hundred to millions of dollars for a single 90p spin. 7 Sultans offers 24/7 English support via Live Chat, email, Skype and their free helpdesk numbers, and as well as English speakers they offer support in French, German, Spanish, Italian, Greek, Portuguese, Dutch, which is a fantastic feature offered by this internationally renowned site. Depositing is straightforward too – they accept all main forms of deposit including Visa and Mastercard, Neteller, Skrill, UKash, bank transfer and cheque. 7 Sultans offers the gameplayer a good experience, but perhaps not the most up to date out there. However, there is some excellent choice of games with great jackpots, and their triple deposit bonuses will sweeten the deal for new players considering where to deposit their next funds. Refer a Friend system and earn money ! Non Automatic bonus. Have to claim via website.